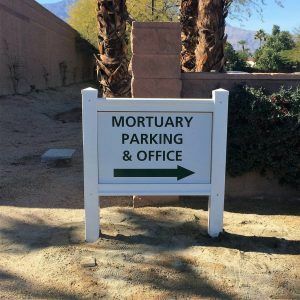 Outdoor business signs have a lot of different and important purposes. From directing you to the entrance or showing you where to park, they are crucial to helping a customer navigate. Post and panel signs are named so because there is a panel with information that is mounted onto a post of some sort. The post and panel signs that we make have posts made from high-quality vinyl, and these are for permanent use. As you can see from the photos, this is not a type of sign where the information is changed out frequently. 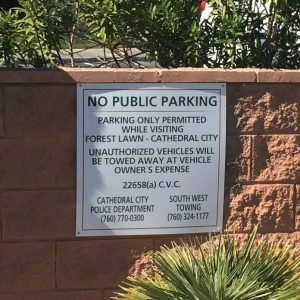 Forest Lawn asked us to replace eight of their existing post and panel signs along with two “No Public Parking” signs. We updated the look of these directional signs by changing the font color from a typical blue to their corporate green and changed the font type to their more modern font. 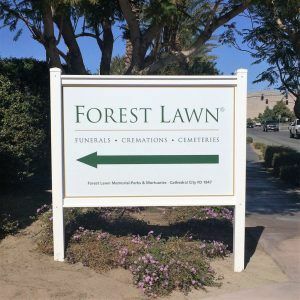 For each sign, we digitally printed Forest Lawn’s logo and their requested text onto white, opaque vinyl which we then laminated. The vinyl was then applied to .063″ aluminum. The “No Public Parking” signs were secured to the stone wall. We installed the remaining panels into vinyl sign frames which we then installed into the dirt with concrete. The frames we use are made from structural grade vinyl so they are very long lasting and perfect for outdoor use. Our post and panel signs come in different sizes and styles to suit your business. They can be single-sided or double-sided. We also have posts with hanging panels which are also made from the same high-grade material. Give us a call today if you’re interested in getting a post and panel sign or a mounted digital print sign for your business. With the use of our wide format printer, the information on the signs is completely customizable.